Language choices in corporate narratives have been identified as a potential form of impression management exploited by corporations under particular performance scenarios. One possible language choice is the use of metadiscourse. Metadiscourse use involves selecting the language used so as to influence the flow, structure and understandability of narratives. Conceivably metadiscourse use may be contingent upon corporate performance and be affected by factors impeding the corporation’s ability to create profit such as the global financial crisis (GFC). The GFC reached its peak impact on the Australian economy during the second half of 2008. The crisis provides an opportunity to examine the strategic use of language by corporations in creating their performance stories. 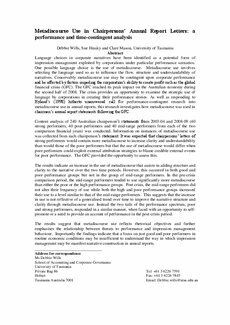 As well as responding to Hyland’s (1998) hitherto unanswered call for performance-contingent research into metadiscourse use in annual reports, this research investigates how metadiscourse was used in chairmen’s annual report statements following the GFC. Content analysis of 240 Australian chairperson’s statements from 2003-04 and 2008-09 (40 strong performers, 40 poor performers and 40 mid-range performers from each of the two comparison financial years) was conducted. Information on instances of metadiscourse use was collected from each chairperson’s statement. It was expected that chairpersons’ letters of strong performers would contain more metadiscourse to increase clarity and understandability than would those of the poor performers but that the use of metadiscourse would differ when poor performers could exploit external attribution strategies to blame credible external events for poor performance. The GFC provided the opportunity to assess this. The results indicate an increase in the use of metadiscourse that assists in adding structure and clarity to the narrative over the two time periods. However, this occurred in both good and poor performance groups but not in the group of mid-range performers. In the pre-crisis comparison period, the mid-range performers tended to use significantly more metadiscourse than either the poor or the high performance groups. Post crisis, the mid-range performers did not alter their frequency of use while both the high and poor performance groups increased their use to a level similar to that of the mid-range performers. This suggests that the increase in use is not reflective of a generalised trend over time to improve the narrative structure and clarity through metadiscourse use. Instead the two tails of the performance spectrum, poor and strong performers, responded in a similar manner, when faced with an opportunity to self-promote or a need to provide an account of performance in the post-crisis period. The results suggest that metadiscourse use reflects rhetorical objectives and further emphasises the relationship between threats to performance and impression management behaviour. Importantly the findings indicate that a focus on just good and poor performers in routine economic conditions may be insufficient to understand the way in which impression management may be manifest narrative construction in annual reports.